“Can you imagine? A year ago you were only talking about coming to Ireland. Now you’re actually here doing something,” Emmett grinned as he pulled his head back behind the console. I smiled back before pulling my hydrophone onto his boat, the Swilly Goose. I hadn’t expected to have another philosophical scientist on this trip, but his words weren’t lost on me. That “something” we were doing was a simple range test, determining the maximum distance that we would be able to hear the signal of a transmitter. 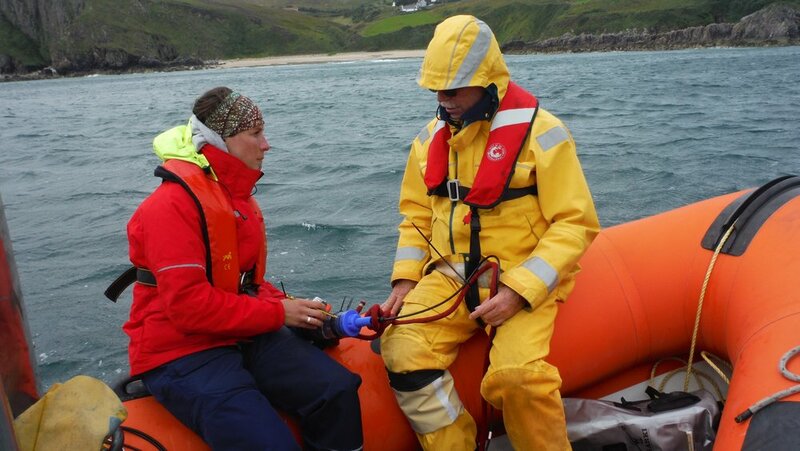 Though currently anchored in the water roughly one kilometer from our boat, the transmitter would eventually be attached to a basking shark – ideally, one that we would be able to detect and follow using the hydrophone. Today, however, the winds were high and the sea full of small whitecaps. Active tracking would have to wait. But Emmett was right; a range test would provide valuable information for our study, and more importantly, I felt very lucky to simply be here. Approximately two years ago, I was approached by Dr. Peter Klimley (known as “Dr. Hammerhead” by most of the shark community) to join his biotelemetry laboratory at the University of California – Davis. He was recruiting a PhD student to collaborate with a group of organizations in Ireland to study basking sharks. Apparently I was an ideal candidate: “You’re a McInturf! You have some Irish in you!” Fortunately, he assured me later that my skills would also be an asset to this position. After one full year of PhD coursework, teaching, grant applications, and a wonderfully successful crowdfunding campaign, I have finally arrived. The first week of this field season has passed. I’ve taken up residence on Inishowen, the northernmost peninsula in all of the Republic of Ireland and part of County Donegal. My bedroom is littered with shark tags, buoys, equipment manuals, shark books and the odd jar of plankton, but this is just the staging area. More often than not, in spite of the gusty conditions of a nascent Irish autumn, we are in our element: out on the water, looking for sharks. Naturally, I am not alone. Eagerness and enthusiasm cannot trump the value of experience and a scientific mind. While Dr. Hammerhead himself has accompanied me to Ireland for the first part of my stay, I am working most directly with Emmett Johnston, a leader in the Irish Basking Shark Study Group (IBSSG) and a supportive and skilled collaborator. A Conservation Ranger for Inishowen and Navigator at the RNLI Lough Swilly Lifeboat Station, Emmett’s experience on the water with the wildlife in this area will be critical to our project. Thankfully, he’s also taken a break from his PhD thesis on basking shark behavior to serve as our host to the area. Emmett lives with his family on Inch Island, which also hosts one of the most picturesque landscape I have seen in my travels: sheep and gray stone homes amid fields of vibrant green. Perhaps more importantly, Inch Island is located in Lough Swilly. A small body of ocean water on the western part of Inishowen, the lough (pronounced “lock”) is prime basking shark territory. In the past week, Emmett has braved not only rough ocean conditions at our request to test the equipment, but he has also driven us all over Inishowen (by land) on a cultural tour of the area. This past Thursday, he sportingly transported us to Belfast, for a seminar series with his laboratory at Queen’s University-Belfast (QUB). It was here that I first met the other members of this collaboration, specifically the renowned marine ecologist Dr. Jonathan Houghton. After several days enduring less than ideal weather on the water, it was wonderful to “talk science” with a group of extremely capable and interesting people. Dr. Houghton’s laboratory studies pelagic (literally “open sea”) ecology, and his students presented on organisms ranging from ocean sunfish to a variety of shark species, which of course included the basking sharks. To continue the ever-growing theme of Irish hospitality, Dr. Houghton and his crew kept the wheels turning all through dinner at a local restaurant. Finally exhausted, we drove into the early hours of the morning to return to Donegal, in order to continue our preparation for a break in the weather.